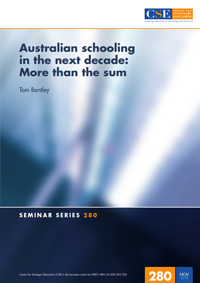 The author discusses the pursuit of national educational reform in recent times and concludes that despite initial success in policy development and new governance architecture, according to standard national measures,Australia’s schooling outcomes have remained static. He comments on the context of the global financial crisis; the adverse impact of competitiveness in Australian education; lessons to learn on school funding; unresolved issues of equity; and the reality of interdependence that has yet to be addressed. He concludes by identifying the elements of a new Australian settlement, based on a move from competing systems and fragmentation towards a shared ecosystem, founded on rigorous evidence.